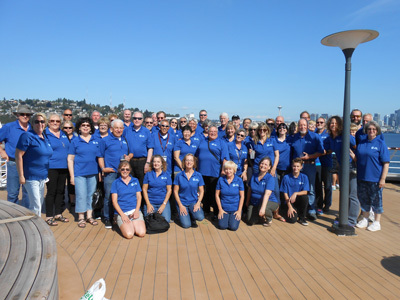 Over 50 dancers joined Jimmi and Dave Serfling on the Rockin’ Horse Dance Barn’s Alaska Dance Cruise 2015. There was way more fun being had than just dancing although there was a lot of dancing. We danced every night, competed in Dancing with the Stars at Sea, Dave’s group dance lessons, randomly whenever someone felt like it and even walking through town when we were in ports of call. Everyone in the group was fun to be with and we shared the same dining section every night for dinner so we could catch up on the day’s events and sometimes catch site of some swimming wildlife. The Shore Excursions were wonderful and the stories and pictures were great. We did tours on a giant 15 passenger bike, canoes, boats, tramway, hummer, hiking and walking and maybe even by plane or helicopter.